Participants select color-coded wristbands to aid them in team formation at the beginning of Global Game Jam. Photo by Lluvia Moreno. 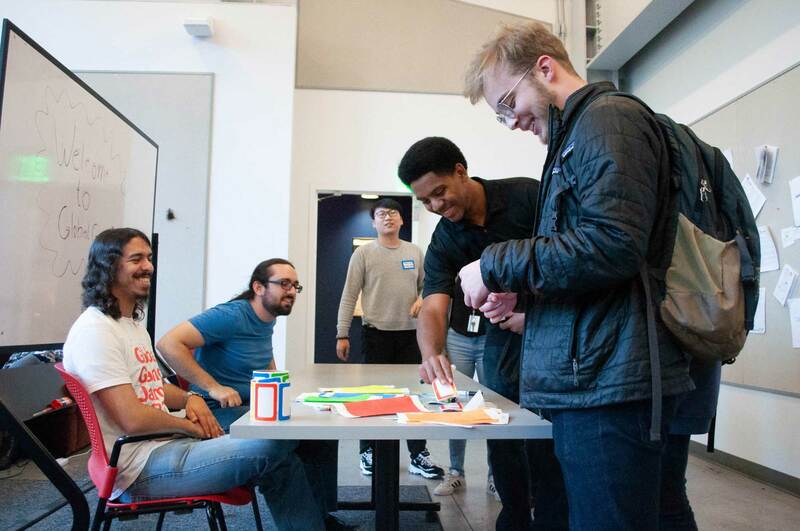 About 135 game designers, donning wristbands of red, yellow, blue and green, filled the Digital Arts Research Center in preparation for the 11th annual Global Game Jam (GGJ). This global event develops communities’ interest in the world of game design — a large field combining computer science with graphic design to produce video games. Inspired by the Nordic Game Jam, started in 2006, current President Susan Gold founded GGJ. in 2008. Gold envisioned an event to unify the gaming world, and it’s doing so on an upward trajectory. 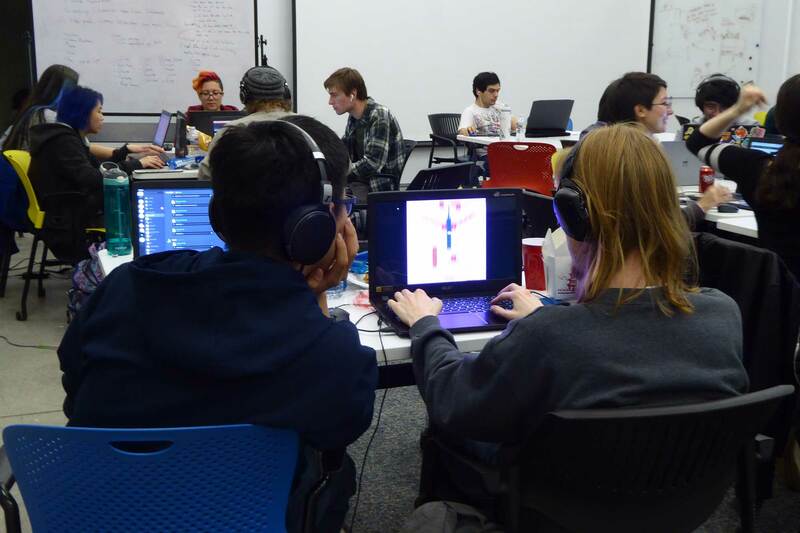 In nine years, due to a growing global passion for game design, GGJ gained over 41,000 participants, growing from 1,600 participants in 2009 to 42,811 participants in 2018, said executive director Seven Siegel. Countries, states and cities can apply to host the competition, which takes place annually in January. From Jan. 25-27, participants engaged in a weekend chock- full of game creation. UC Santa Cruz was one of 860 global host sites in 2019, holding to a four-year hosting legacy. Game designers huddle in teams and collaborate on their vision. Photo by Josephine Joliff. announcement of the 2019 theme, “what home means to you,” the game jam commenced. The purpose of the surprise is to prompt participants to enter the event with a clear mind and make tough decisions once being informed of the theme. The GGJ organizers kept the theme under wraps until the beginning of the event. Even the site organizers weren’t in on the reveal to keep the theme truly secret. Fourth-year Liam Dugard worked as the UCSC site organizer. After the reveal, participants formed groups based on the wristbands received at the check-in table. The wide array of wristbands indicated what game design skill the individual excelled in, green representing artists, red representing designers, blue representing programmers and yellow representing sound editors. Over the course of the three days, the teams worked to create games, taking minimal breaks for eating and napping. On Sunday, participants came together to celebrate in a showcase of their labor- intensive games. One by one, teams presented their creations and received lots of positive feedback and applause from the other teams. The GGJ doesn’t award prizes, it serves as a noncompetitive event for game designers to come together for a weekend. Dugard reflected despite not being able to choose a favorite game because of the wide array, he enjoyed watching participants play “Slime Go Home,” a game following a slime blob traversing his way across platforms to find his way home. To mark the endings of each level, the slime discovers a letter from his parent, prompting him to return home. The GGJ was a successful weekend. According to the competition’s website, the 2019 event attracted about 47,000 participants globally who created about 9,000 new video games.